If you're stuck in the past or just desperately want to relive the Atari, then Ion's iCade Arcade Cabinet may be the perfect accessory for your iPad. However, the device is overpriced and there are some annoying issues that detract from its overall appeal. Ion Audio's iCade Arcade Cabinet for iPad actually started off as an April Fool's joke, but it's now a very real product. 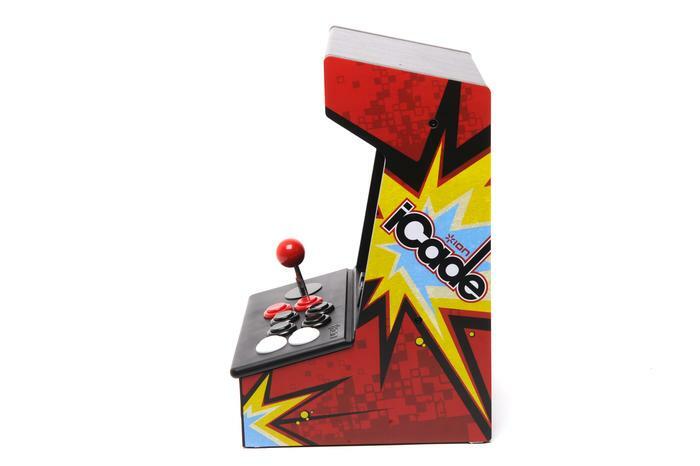 Attempting to recreate the feel of an 80's style arcade machine, the iCade Arcade Cabinet is a basic wooden box with a joystick and button combination that allows users to play Atari games on their iPad. Unfortunately, it's overpriced and there are a few annoying oversights. 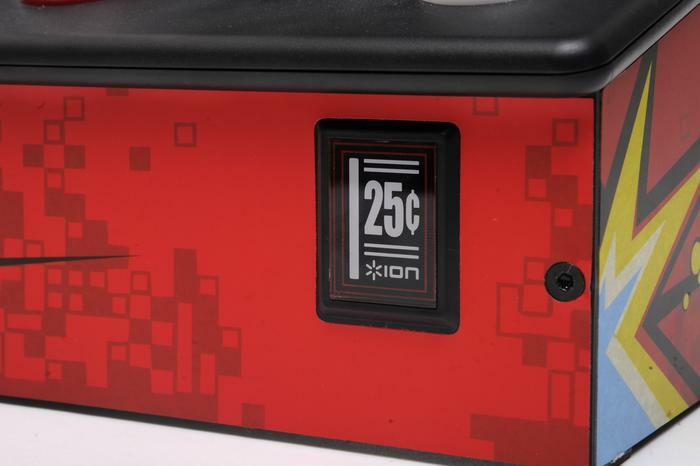 Our review sample of the Ion Audio iCade Arcade Cabinet was already assembled when it arrived, but you won't get the same luxury when purchasing it. It requires manual assembly but the instructions look simple enough and the entire process shouldn't take any longer than around 20 minutes. The process looks similar to assembling a piece of Ikea furniture, complete with screws and an allen key. 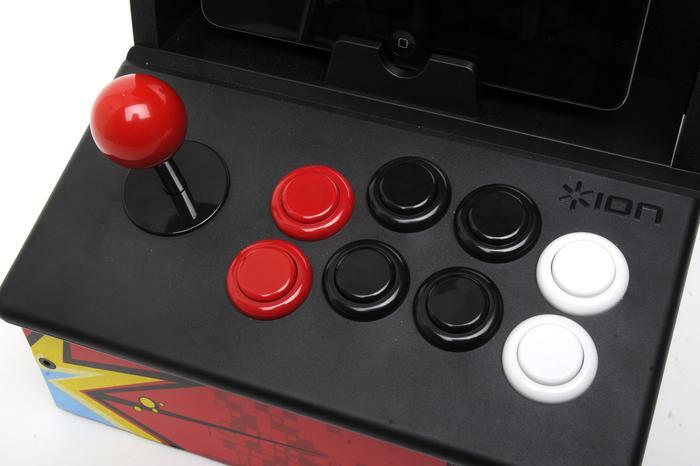 The iCade is constructed from cheap timber, what looks to be MDF or particleboard. It's covered in large stickers that are a throwback to the arcade machines of the 80s, but we found the stickers quickly peel off from the corners and the edges of the timber are susceptible to chips. This shouldn't pose a problem, however, provided you leave the iCade in one spot. We also liked the four rubber feet on the bottom that prevent the cabinet sliding around while you're using it. Once assembled, the Ion Audio iCade Arcade Cabinet forms a mini arcade machine that has a slot for your iPad. Conveniently, the slot that the iPad sits in is device agnostic so it works with most models of Apple's tablet including the iPad 2, the third generation iPad and the new fourth generation iPad with lightning connector. The dock is merely a rest for the iPad, but a charging cable can be run through the back of the iCade Arcade Cabinet if you're running low on battery. The iCade requires manual assembly but the entire process shouldn't take any longer than 20 minutes. The iCade uses a Bluetooth connection to pair with the iPad, but the initial connection process is a little awkward. It requires multiple button presses as well as the use of joystick. This only needs to be done once, though, and the pairing instructions are printed underneath the folding lid if you forget them (which you undoubtedly will). The iCade Arcade Cabinet is powered by two AA batteries hidden in a plastic slot on the bottom and there's a fake coin slot on the front that glows red when it's powered on. Once paired with your iPad, the iCade registers as a Bluetooth keyboard. This means if you want to enter text while it is connected (like searching for the Atari Greatest Hits app on the App Store, as we did) you'll need to disconnect the iCade first. It quickly becomes an annoyance, especially when you need to enter your iTunes store password to confirm in-app purchases, for example. 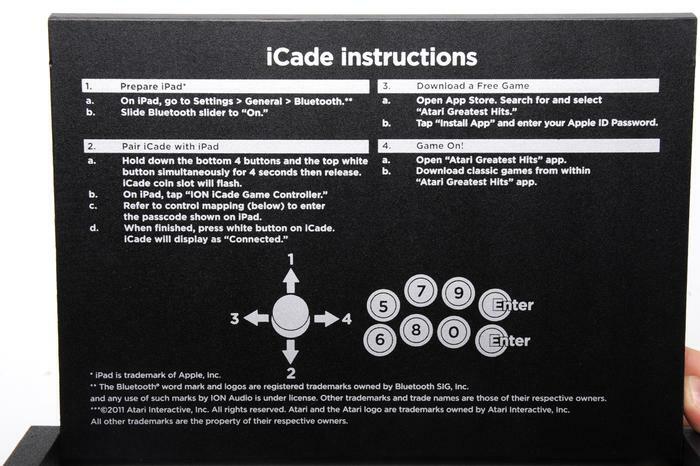 The iCade's Bluetooth pairing instructions are printed underneath the folding lid if you forget them. The Ion Audio iCade Arcade Cabinet works first and foremost with the Atari Greatest Hits app, which is a free download from the App Store. There are 99 games available but only Missile Command can be played for free. Other games can be played by using tokens (15 tokens for 99 cents), or you can purchase all 99 games for a one off price of $10.49. Various games are also sold in packs of four for 99 cents. Games on offer include Centipede, Battle Zone and Pong and there's a mixture of Atari 2600 and traditional Atari arcade titles. The gameplay experience is largely satisfying, though many of the Atari 2600 games simply aren't suited to the iCade's joystick and button combination. The controls on the iCade work well enough, but the joystick isn't the most accurate for short movement. In addition to the Atari Greatest Hits app, the iCade Cabinet also works with a number of other third-party apps. The compatible list includes apps like Pac Man for iPad, Commodore 64 and Activision Anthology. The controls on the iCade Arcade Cabinet work well enough, but the joystick isn't as smooth as we'd have liked and isn't the most accurate for small movements. The buttons are also very loud when pressed, though this only adds to the overall arcade experience. There are eight buttons in total, though most games in the app only use three of them. There's a fake coin slot on the front that glows red when the unit is powered on. All in all, the Ion Audio Arcade Cabinet is a cool accessory if you regularly play arcade style games on your iPad, but it's overpriced and does have some annoying issues.